Because your Halloween isn’t complete without this. First I showed you how to use the Nordicware Cookie Cup pan* to make 3D Candy Filled Baseball Cap cookies. Then I showed you how to do the same thing but turn it into a Jack-O-Lantern instead. But this isn’t one of those normal blogs for sane and sensible people. This is Eat The Evidence. 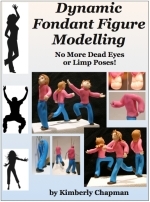 This whole blog is about pushing the boundaries into the nerdy, the weird, and the downright freaky. 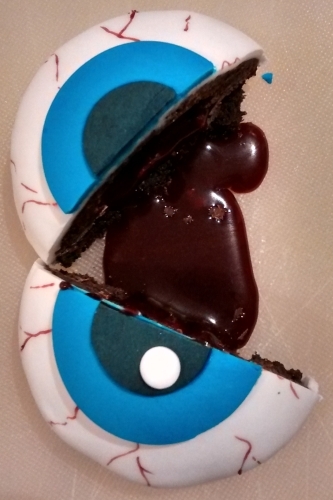 And thus I know you’ve all been waiting to find out how to make eyeball cookies that bleed chocolatey fake blood into your mouths when you bite them. Am I right or am I right? Exactly. 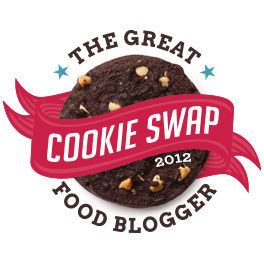 To make these cookies, you’ll need a batch of your preferred rolled cookie dough (I recommend my Dark Chocolate Rolled Cookies), some of my fake blood recipe, and either the Nordicware Cookie Cup pan or something similar that makes half-sphere cookies. 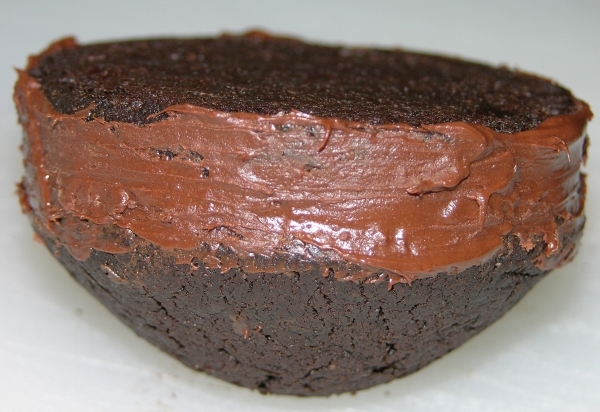 Melt some chocolate like you would to seal up the regular Base Cookie, but this time use it to coat the inside (concave) side of the cookie cup, plus the top of the round. 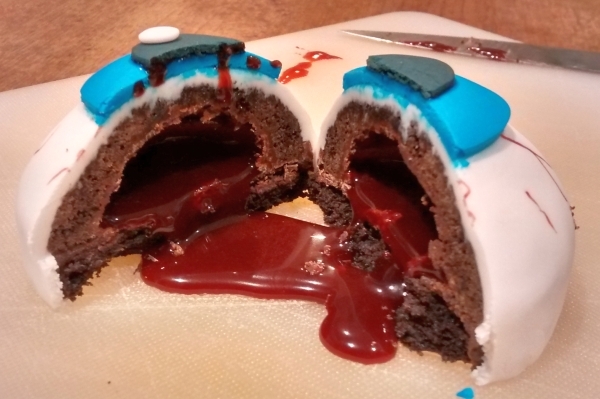 The fake blood is very wet, will make the cookie soggy, and eventually leak out unless you create a chocolate pocket inside the cookie to contain the blood. It is vital that you cover the entire interior surface thoroughly. Then let the chocolate harden fully, boosted in the fridge if necessary. The chocolate must be 100% hardened or it will combine with the blood and leak out. Once it’s hardened, pour in some of the fake blood, but do not overfill. Better to have an air gap than a leaky, sticky mess. 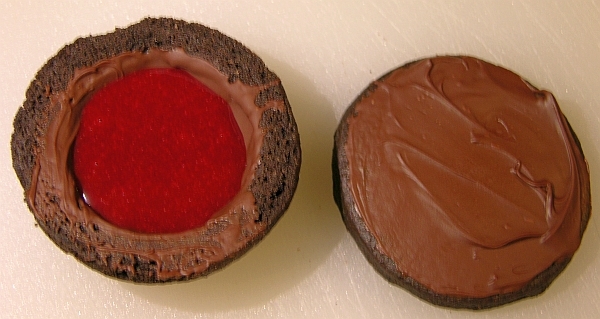 Pipe a bit more melted chocolate around the cup edge and then put the round on it with the chocolate coating on the inside. 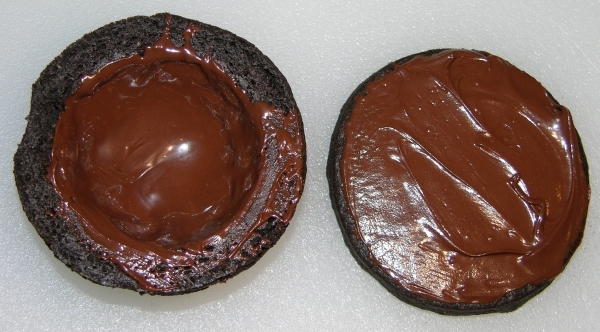 This new melted chocolate will seal the round to the cup. Give the round a bit of a twist against the cup to ensure it’s really secure, but try not to wiggle it more than necessary so the blood will stay down and let this new chocolate set up without mixing. While this chocolate is still warm, carefully use a spatula or knife to smooth it around so you don’t end up with any lumps at the seam, and to help make sure the seal is complete. Be sure to leave the cookie upside down until this chocolate is set. Push the chocolate inwards as you go to ensure there are no leaks. Once you’ve got your cookies sealed up with blood inside, the rest is actually really easy, especially if you have a set of graduated circle cutters. Roll out some white fondant. Brush some corn syrup thinned with some water over the cookie and then put the white fondant over, smoothing downward as you go. 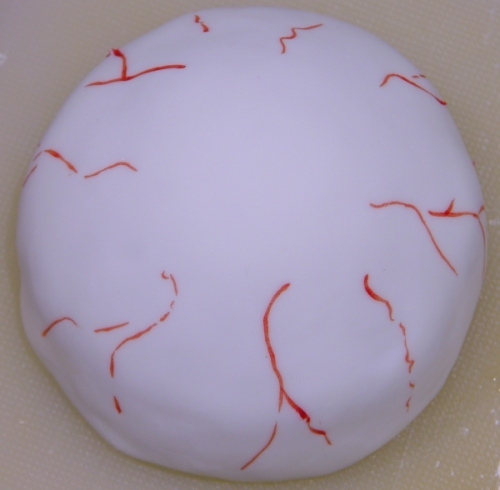 You can either pre-cut the fondant with a wide enough circle cutter, or else just do a blanket and trim it around the edges. A pizza wheel is the easiest way to trim around, but a knife will do. 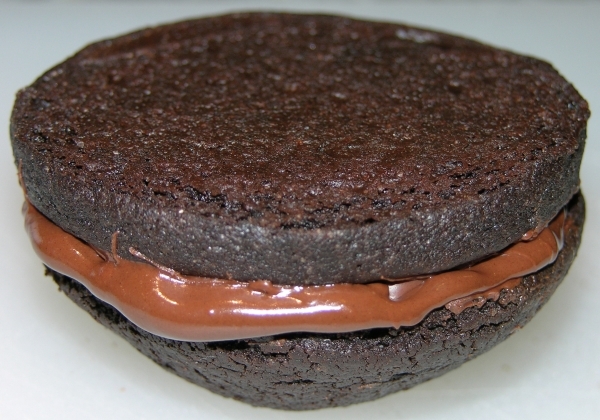 Trim inward, not downward, to tuck the white under and cover the cookie completely. Use a red edible ink marker or a brush with a bit of red food gel to draw some squiggly blood vessels around the eye, as in the photo below. The blood vessels help direct the eye (heh) away from any imperfect lumps. Next, roll out some blue, brown, green, or whatever iris colour you like and cut out a circle. Affix it in place with a bit of water or some of your previous watered-down corn syrup. Then roll out some black, cut a smaller circle, and affix it in the same way on the blue. Make a tiny white ball, flatten it, and affix it in place. Voila! 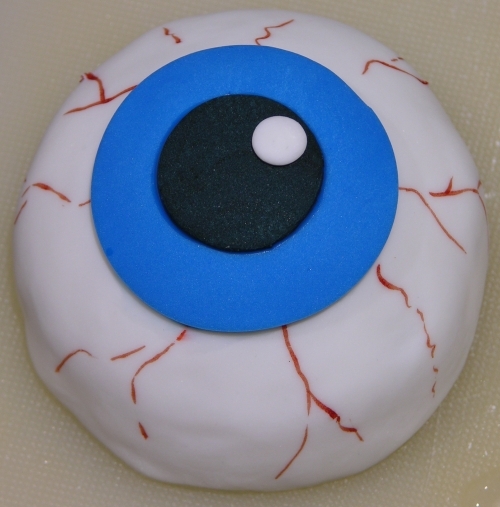 Eyeball cookie! The white dot is technically optional but it really does improve the way the eye looks. Note that the fake blood can stain, so make sure your recipients are least somewhat prepared for stuff to leak out. Also be prepared for pedants who’ll complain that it should leak white goo instead, and suggest to them that they go ahead and make a mint-cream filled variety if they like. The blood is thick and continues to ooze out over time. 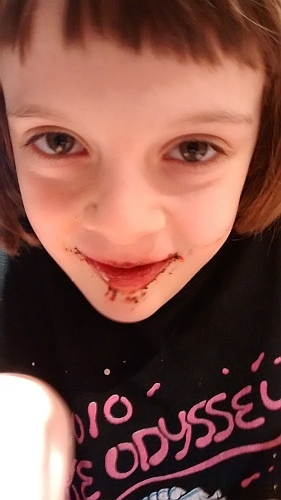 Peo loved it and declared it, “Gooey and chocolatey.” Then she worried about police getting confusing evidence if there was a murder in our house. Not that she was worried about the murder…just the confusing blood spatter. Priorities. We have ’em. Behold the face of evil. * Again note that I haven’t received any compensation or consideration for recommending that pan. I purchased it independently and just really like it. 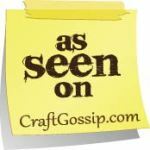 I provide the link to their store for information only. It is not an affiliate link. 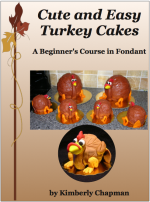 I bought mine at my local cake shop. 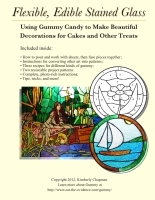 This entry was posted in 3D Cookies, Cake Decorating, Cookies, Experimental Techniques, Sick and Twisted. Bookmark the permalink.